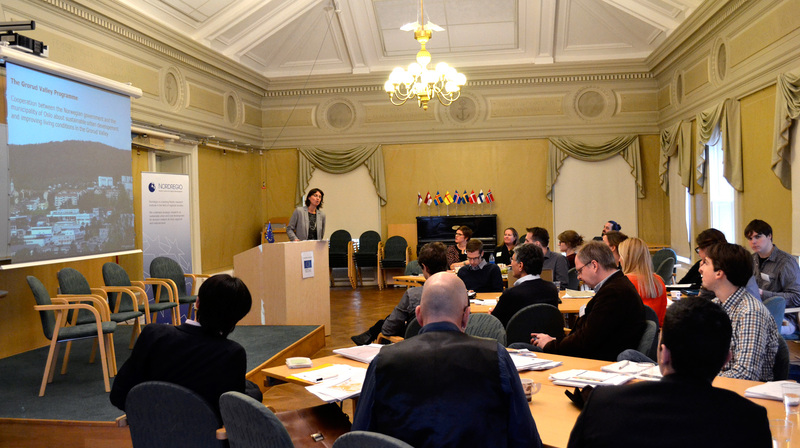 The final workshop and seminar of “The Territorial Dimension of Poverty and Social Exclusion in Europe (TiPSE)” gathered project partners, researchers, stakeholders at grass root, local and regional level at Nordregio. Findings of the project were presented in terms of mapping patterns of poverty and social exclusion in Europe, and how this could be relevant to Nordic actors. The first half of the seminar consisted of presentations by TiPSE project partners who shared the results of this 3-year project. 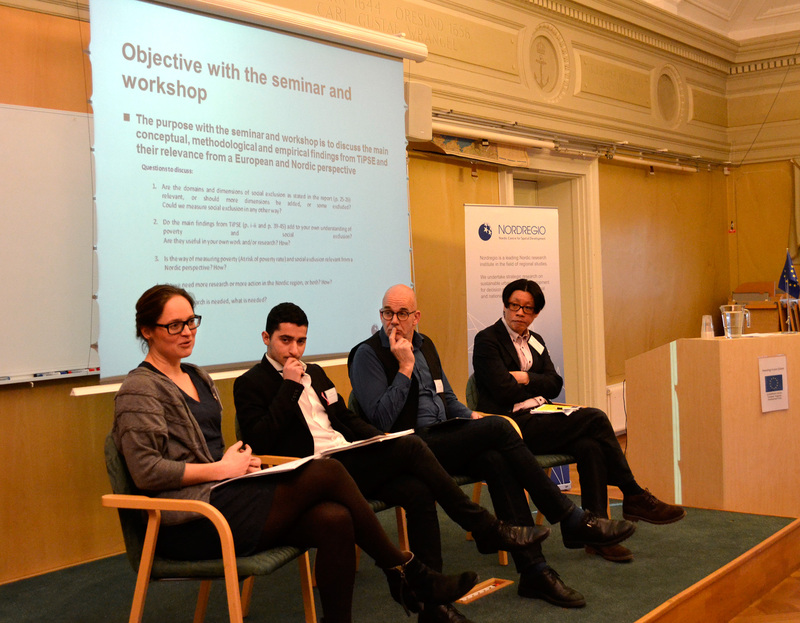 Christian Dymén from Nordregio and Ali Madanipour, Newcastle University, England, introduced the workshop and the two concepts of poverty and social exclusion, how they overlap and the way in which they have featured in EU policy discourses in recent years. Andrew Copus from James Hutton Institute, Scotland, proceeded to further problematize the measurement of poverty, making the case for better data at NUTS 3 level in order to improve our understanding of the causes and effects of poverty. Gergely Tagai from the Research Centre for Economic and Regional Studies at the Hungarian Academy of Sciences, Hungary, then shared his research findings about the spatial patterns of social exclusion, identifying distinct trends and divides between North-South, East-West and core-periphery. This being said, more nuanced patterns were also found within regions, where the urban-rural patterns of social exclusion are more complex. As a final presenter of the first session, Isabel Ramos Lobato from ILS – Research Institute for Regional and Urban Development, Germany, concluded by pointing to some of the deeper factors affecting both poverty and social exclusion, identified in the case studies: space and scale both have an impact on how these trends play out spatially, acting as drivers and alleviators depending on the specific context of the cases. The afternoon session placed the project findings in a Nordic context, with presentations and debates about Poverty and Social Exclusion in Sweden, Norway and Denmark. Tobias Hübinette, Mångkulturellt Centrum, Sweden, spoke about the need to reintroduce “race” in policy research and debate. He pointed at the Swedish paradox, whereby while Sweden in many ways both views itself and has enacted anti-racist policies and legislation, the reality is that the country as a whole and larger city regions especially are becoming increasingly segregated along ethnic lines. Marianne Gjørv from the Urban Development in the Grorud Valley in Oslo, Norway, presented some of the efforts part of the ambitious plans for the redevelopment of this disadvantaged neighbourhood. Marianne Gjørv from the Urban Development in the Grorud Valley in Oslo. In the panel discussion Evert Kroes from the Stockholm County Council, Sweden, Mette Fabricius Madsen, from the Center for Boligsocial Udvikling, Denmark, and Flaktrim Hani, Ungdomsforum Västra Göteborg,Sweden, along with previous speakers, further discussed how research can be made more relevant for policy-makers, underlying the need for small-scale data and closer dialogue between stakeholders and researchers to provide evidence-based policies to address the challenges posed by poverty and social exclusion.